The Members of the Organisation of American States are Argentina, Bolivia, Brazil, Canada, Chile, Colombia, Costa Rica, Cuba, Dominican Republic, Ecuador, El Salvador, Guatemala, Haiti, Honduras, Mexico, Nicaragua, Panama, Paraguay, Peru, the United States of America, Uruguay, the Bolivarian Republic of Venezuela, Barbados, Trinidad and Tobago, Jamaica, Grenada, Suriname, Dominica, Saint Lucia, Antigua and Barbuda, Saint Vincent and the Grenadines, the Bahamas, St. Kitts and Nevis, Belize, and Guyana. Syllabus of the Program - Inter-American Development Bank. The Members of the Economic Commission for Latin America and the Caribbean are Antigua and Barbuda, Argentina, the Bahamas, Barbados, Belize, Bolivia, Brazil, Canada, Chile, Colombia, Costa Rica, Cuba, Dominica, the Dominican Republic, Ecuador, El Salvador, France, Germany, Grenada, Guatemala, Guyana, Haiti, Honduras, Italy, Jamaica, Japan, Mexico, the Netherlands, Nicaragua, Panama, Paraguay, Peru, Portugal, Korea, Saint Kitts and Nevis, Saint Lucia, Saint Vincent and the Grenadines, Spain, Suriname, Trinidad and Tobago, the United Kingdom, the United States of America, Uruguay, and Venezuela. The associate members are Anguilla, Aruba, British Virgin Islands, Montserrat, the Netherlands Antilles, Puerto Rico, Turks and Caicos Islands, the United States Virgin Islands. 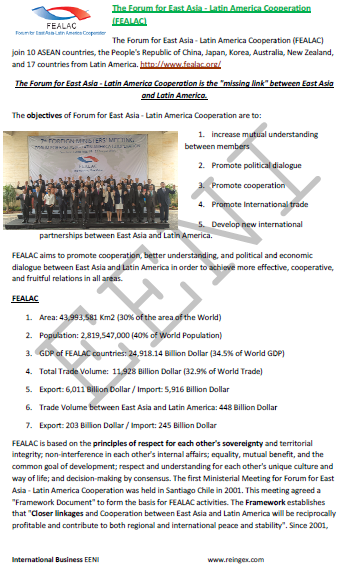 Syllabus of the Program: Forum for East Asia-Latin America Cooperation. 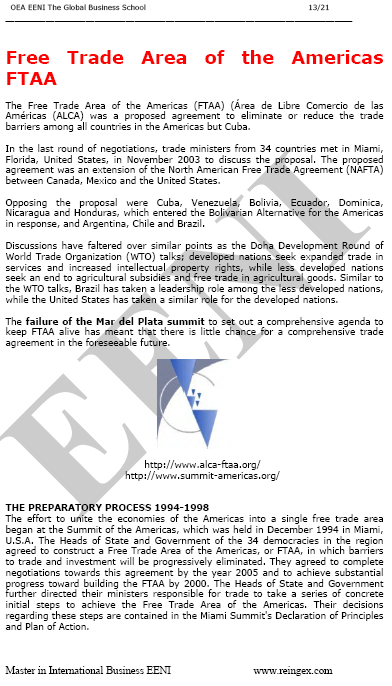 Syllabus of the Program - Summit of South American-Arab Countries (ASPA). The Latin America member countries of the ASPA are Argentina, Brazil, Bolivia, Colombia, Chile, Ecuador, Guyana, Paraguay, Peru, Suriname, Uruguay, and Venezuela. 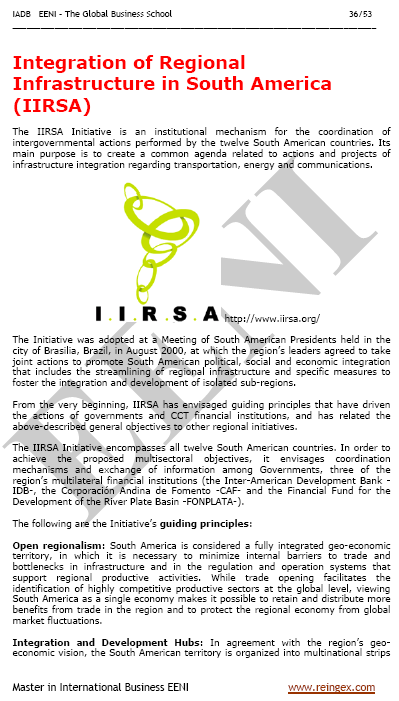 Syllabus of the Program - Community of Latin American and Caribbean States (CELAC). 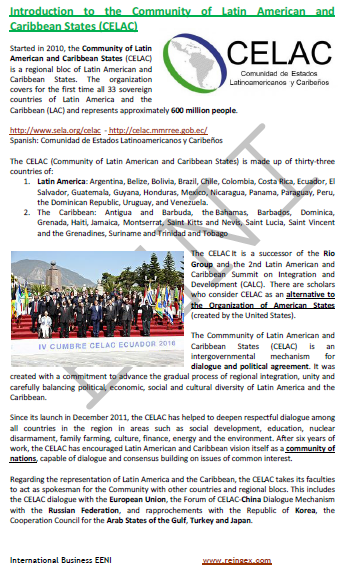 The objective of the subject “Community of Latin American and Caribbean States (CELAC)” is to understand the objectives and functions of the CELAC. Latin American CEALAC countries: Argentina, Belize, Bolivia, Brazil, Chile, Colombia, Costa Rica, Ecuador, El Salvador, Guatemala, Guyana, Honduras, Mexico, Nicaragua, Panama, Paraguay, Peru, the Dominican Republic, Uruguay, and Venezuela. The Caribbean CEALAC countries: Antigua and Barbuda, the Bahamas, Barbados, Dominica, Grenada, Haiti, Jamaica, Montserrat, Saint Kitts anNevis, Saint Lucia, Saint Vincent and the Grenadines, Suriname and Trinidaand Tobago.